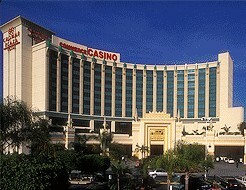 Day 1 has wrapped at the LA Poker Classic at the great Commerce Casino. 379 remain. Leading the field is Ali Eslami with 137,000. Stacked up with him is GSN High Stakes Poker reg Eli Elezra with 125,000, and former WSOP ME runner-up (and 2003 Bellagio Five-Star World Poker Classic WPT champ) Alan Goehring with 120,000. Also among the leaders are Bill Gazes (115,000), Erick Lindgren (110,000), and Hassan Habib (90,000). Check out Poker Wire for full, updated chip counts and Tao of Poker for live blogging when play kicks up again today at 3:30pm (EST). btw i must say I’m mad that I’m not playing the LA Poker Classic this year. I should be there and I should be winning. It’s all very disappointing to me. anywho..time to go eat some chicken tacos.